Located in Upper Egypt, Luxor is one of the most popular tourist destinations of Egypt. Popularly known as world's greatest open air museum, Luxor has a collection of fascinating monuments, temples and tombs on the West Bank Necropolis. Luxor is called the religious capital of Middle Kingdom and New Kingdom Egypt. Luxor is a modern city served by the Luxor International Airport which receives thousands of international tourists every year. The travelers arriving at the airport can hire a car and explore all the attractive destinations of the city at their own pace. Lying on the River Nile, Luxor is a modern city divided into smaller districts which has numerous fascinating attractions. On the east bank of the city are the attractions like Luxor Temple, The Museum, trains, the Temple of Karnak, excellent range of hotels and restaurants. The travelers can find the major ruins like Valley of the Kings, the Valley of the Queens, the Western Valley ruins and many other important sites o the west bank. The famous attractions of Luxor include the Valley of the Kings, the Tombs of the Nobles, Medinet Habu and the temple complexes of Luxor and Karnak. Luxor has numerous accommodation options which include luxurious hotels, economical hotels and hostels where the travelers can have comfortable stay. Renting a car with Egypt Car Rental is the best way to explore Egypt. Egypt Car Rental is the most accessible and affordable way of commuting for the travelers. 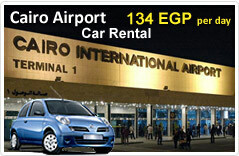 With several locations throughout Egypt, Egypt Cars Rental offers the best car hire deal in the industry. At Egypt Cars Rental the travelers can find a great range of new cars, the lowest car rentals and a great car hire service.